Results of a major new consumer research study performed by Edison Research, supported by Pandora and Omnicom MediaGroup, has been released today. Top-line takeaways include frequency of station switching among AM/FM listeners, and desire for digital technology in dashboards. First, a note about the study methodology. The two-part study included participants who make daily car commutes of at least 20 minutes in each direction. The first part was an online survey of 1,000 commuters, and the second recorded the activities of 109 respondents in their vehicles with GoPro cameras. Both parts were conducted during summer of 2018. Edison conducted similar research in 2015, providing data points for comparison. 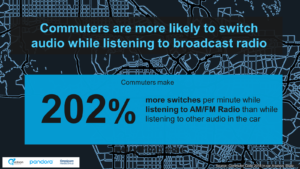 The video analysis found that 68% of drivers listened to AM/FM radio during their commutes, down from 83% in 2015. A quarter (25%) of in-car time spent listening recorded by the GoPro cameras was spent listening to streaming audio or podcasts. General speech-based content took a 38% share of in-car time spent listening. 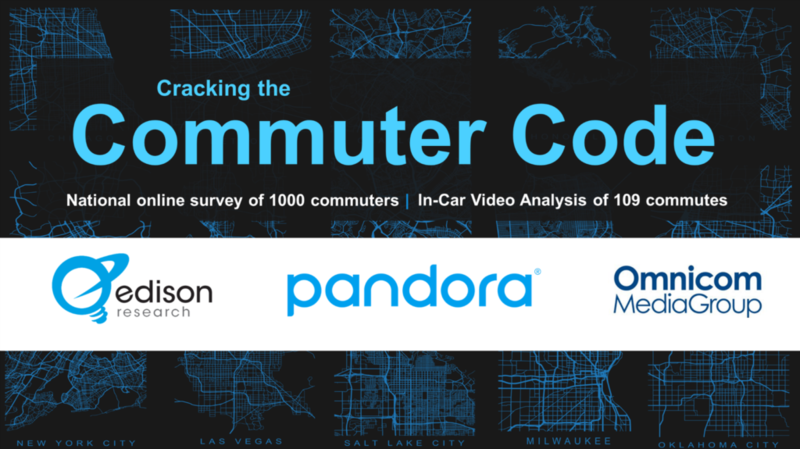 Based on the online surveys, Pandora was the top streaming audio brand with 32% of commuters using the service in their cars. Spotify came next with a 23% share, followed by Amazon Music with 11%. The commuters listening to AM/FM radio were more likely to change up their listening during their drives, making 202% more switches per minute while listening to broadcast radio than while tuned in to other in-car audio. Two-thirds of commuters said they change the radio station to shift the music, while 36% said they change stations to avoid AM/FM commercials. 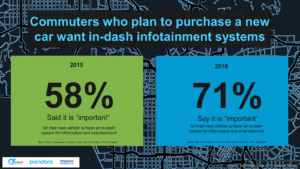 Interest in vehicle technologies was high across the overall audience, with 71% of commuters who are one-year auto intenders dubbing it “important” for their next car to have an Internet-connected infotainment system. Among those participants who already have an in-car infotainment platform, 70% of commuters said they use it every day. Just over half (51%) of the commuters said they have listened to audio by connecting their cell phone to their car’s audio system. Restless commuters are constantly switching audio sources. They index high for women, persons aged 18-34, heavy AM/FM usage in the car, longer commutes, one-year auto intenders, and find it “very important” to have an in-dash media system in their next vehicle. Seekers switch occasionally. They index high for men aged 35-54, listen to some AM/FM and some streaming in car, longer commutes and find it “somewhat important” to have an in-dash system. Half (48%) of commuters fall into this cohort. Keepers switch rarely during their commutes. They index high for men aged 55+, listen to AM/FM almost all of the times in car, shorter commutes, higher incomes, and find it “not at all important” for next car to have an in-dash system. The importance of in-car listening generally, regardless of audio source, is what drove this research. According to the study, in-car listening makes up 295 of all listening, on average. That is eye-opening when you consider the growth of audio listening generally, into new dayparts and environments. Three quarters of employed Americans get their dose of news, traffic, personalities and music from their solo one-hour drives to and from work. So, while the evolution of connected cars might seem slow, it is inexorable, and this study spotlights the desire for, and use of, digital audio in the car. Pingback: Can Starting a Podcast Benefit Your Business?